Second quarter U.K. GDP was even weaker than I, and almost all other analysts, thought it would be, contracting by 0.7% (2.8% at an annualized rate) compared to the first quarter and by 0.8% compared to Q2 2011. The drop reflected to some extent effects of the Queens Diamond Jubilee and could also to a small extent be an illusion reflecting a lack of adjustment for terms of trade improvements, but there is little doubt that there is a real underlying contraction. The fact that the Queens Diamond Jubilee was a one time event that will be reversed will be positive for the third quarter number. But what about the soon upcoming Summer Olympics that will be held in London? Well, that too will provide support as it will increase the number of tourists in the London area and also enable for example hotels and hostels to charge higher prices. However while the Olympics and the reversal of the Queens Diamond Jubilee might provide enough support to push third quarter growth above zero they won't end the underlying decline especially as exports are hit by the reduction in demand from the debt crisis and by the overvalued pound. In the boom years, says Varblane, “GDP growth was not real. It was artificial,” fueled by cheap debt from abroad. The peak, Krugman’s point of comparison, was not “real,” he says. That Estonia has not reached it again is a good thing, Varblane and Ligi say. It never should have been there in the first place. I can't speak for Varblane, but this shouldn't be interpreted that it would be wrong if GDP rose back and unemployment fell back to the levels of 2007. Quite to the contrary, one should strive for GDP to be at least as high and unemployment at least as low as then. What it means is instead first of all that it shouldn't be done in the unsound and unsustainable way as then. And secondly that because the 2007 level of production to such a high extent consisted of the production of malinvestments the level of genuine prosperity, production of things that were really wanted, was in fact much lower than GDP figures suggested. This in turn implies that using 2007 as a base year is misleading and that production of genuine prosperity has developed in a much stronger way. Interesting article about the row between Paul Krugman and Estonia's president Toomas Hendrik Ilves that I've blogged about earlier. Because of the pound's relentless appreciation relative to the euro, British inflation has finally started to fall, though at 2.4% it is still not lower than the euro area average. This is now spun by some reporters as bullish for the U.K. economy because it means that consumer purchasing power increases. But while it is good that it is acknowledged that there are positive aspects of disinflation/deflation these people make the same mistake as those who argue that higher inflation is positive for the economy. In terms of the direct effect, a price change is a zero sum game. A seller benefits from a higher price, or in other words benefits from higher price inflation, while the buyer benefits from a lower price or a lower rate of price increase, or in other words the buyer benefits from disinflation and deflation- But since everyone are both buyers (in their role as consumers) and sellers as workers selling their selling their services in exchange for a wage or salary and/or as investors owning the company that sells products) the aggregate effect of both higher and lower inflation will be neutral. This is not to say that inflation is neutral if you count in indirect effects, because clearly it isn't as it can for example distort relative price something that can both have redistributional effects between different individuals and for example create asset price bubbles or dramatic exchange rate movements. The latter means that inflation will have disruptive effects that weakens growth. But in terms of its direct effect on aggregate purchasing power it is neutral (assuming of course that terms of trade isn't changed) as an increase in inflation means higher nominal income and a decrease in inflation means lower nominal income. Interestingly the same newspaper that published the above mentioned story about the beneficial effects that the strong pound induced decline in inflation have, also published a story about how the strong pound has detrimental effects for exporters. Which is of course an illustration that the purchasing power increasing effect of lower inflation will for the U.K. economy as a whole be cancelled out by lower nominal incomes for exporters and suppliers of exporters, just as the previous purchasing power increasing effect that the previously weak pound had in terms of raising nominal income was cancelled out by higher inflation caused by the same weakness in the pound. For some unknown reason, Ireland, is always slower than almost everyone else in releasing GNP* and current account statistics, and this year it got delayed even more than usual. But now, two weeks in to the third quarter, we have finally gotten its first quarter numbers for the above two indicators. It contained two good news and one bad news. The good news is that Ireland's current account surplus increased and that unlike Greece, Italy, Spain and Portugal (and Britain) Ireland's economy is no longer contracting. The bad news is that it doesn't really seem to recover either like the Baltic countries have started to do. *=GNP is more appropriate for Ireland than GDP because its low corporate income tax has caused corporations to attribute their profits to Ireland in their internal accounting, causing Ireland to formally have an extremely large trade surplus combined with an extremely large investment income deficit. Compared to a year earlier, GNP increased 0.2% as consumption fell while the current account surplus rose. That Ireland has stopped contracting further is of course better than the development in other countries whose recessions deepen, but considering that GNP was 15% lower in Q1 2011 than in Q1 2008, stabilizing at that level is very unsatisfactory to say the least. Though Ireland for seasonal reasons had a current account deficit the first quarter this year, the deficit was smaller than in previous years, so the total balance the last 4 quarters improved from a surplus of €1.8 billion to €2.7 billion, roughly equivalent to 2% of GNP, something that is a big improvement from the 7% of GNP deficit seen in 2007. With the current account in a surplus and with the previously very bloated construction sector having already contracted by three fourths, it seems fair to say that Ireland has rid itself of the imbalances. that caused it to have a crisis in the first place. So why hasn't Ireland started to recover the way the Baltic countries did once they had rid themselves of their imbalances? After roughly two decades of more or less uninterrupted growth, it now seems that Australia might be running out of luck. Employment fell by 27,000 in June, reducing yearly growth to 0.4%. 0.4% growth is actually a lot worse than it sounds as Australia's population is growing by about 1.5% per year and as a result the unemployment rate is up (though still relatively low at 5.2%) even as the labor force participation rate is down. Australia's good fortune has mostly been driven by increased commodity exports to China. But with China slowing down, exports have stopped growing and so has employment. Jeremy Warner argues that the difference between British and Spanish austerity is that Britain is aided by devaluation. 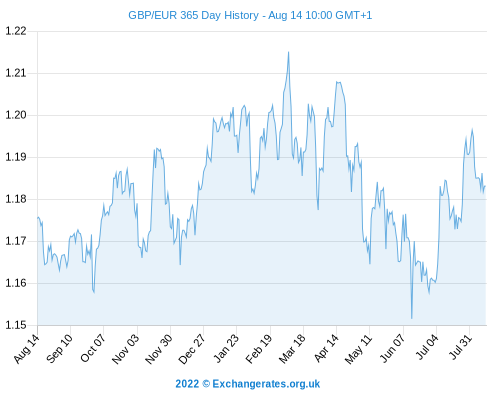 Setting aside the issue over whether that would really be helpful, the truth, as the chart below over the change in the pound's value, is that the pound has been revalued (with an "r")* significantly against the Spanish currency during the latest year while it is Spain has seen its currency significantly devalued. So granting for the sake of the argument the view that a weak currency makes austerity more feasible, Spain is in a better position than Britain, not the other way around. *=or more technically appreciated, but never mind that now. A lot of Keynesians have called for higher inflation. Now it seems that their wish will be granted as a drought hits large parts of the U.S. Midwest. This will not only raise food prices in America, but globally as well because the U.S. is usually a big net exporter of various crops like corn and soybeans, but with such low crops it may not be able to export much, reducing global supply of it, thus raising prices. Tyler Cowen points out that Paul Krugman of the 1970s, the brilliant trade economist whose work later got rewarded with the Nobel price in economics, argued that devaluations are usually contractionary. This conclusion puts him at odds with Paul Krugman of the last 20 years, the Keynesian economist who thinks devaluations is the key to prosperity always and everywhere (or at least everywhere where there isn't full employment.). Bizarrely enough, it was the latter who got to attend the Nobel prize ceremony because the former has ceased to exist. In the last post, I hinted at the discrepancy between the regional numbers for Spain that was posted there and the overall Spanish number, The overall Spanish number referred to the first quarter this year and the regional to last year averages, which given the rise in unemployment since means that the regional numbers underestimate current unemployment. No monthly regional numbers are, as far as I know, available, but the first quarter numbers shows that the region in Spain with the lowest unemployment rate, Pais Vasco in northern Spain, saw its unemployment rate rise 1½ percentage points to 13.5% while the region in Spain with the highest unemployment rate, Andalucia in southern Spain, saw its unemployment rate rise nearly 3 percentage points to 33.2%. The gap between different Spanish regions is thus almost as large in percentage points as the gap between Spain and Austria. That there are big differences in unemployment within the EU, ranging from 4.1% in Austria to 24.6% in Spain is well known. What is perhaps less known is that dramatic differences in unemployment exists within many countries as well (note that the below numbers was last year's annual averages).. In multilingual countries these differences follow to a large extent linguistical divisions, where the pattern seems to be that speakers of Germanic languages have lower unemployment than others. Unemployment is for example significantly lower within Finland's Swedish speaking minority than within its Finnish speaking majority, which is reflected by the fact that the overwhelmingly Swedish (90%) Åland region has an unemployment rate of only 2.5% compared to 8% in mainland Finland where Swedish speakers are only 5% of the population. In Italy, in the majority German speaking South Tyrol region that borders Austria, unemployment is 3.3% compared to 8.5% in the rest of Italy. In Switzerland too, the German speaking parts have significantly lower unemployment (3-4%) than the French and Italian speaking parts (more than 6%). In Belgium, the Dutch speaking Flanders region has significantly lower unemployment (4.3%) than the French speaking Wallonia region (9.5%) and Brussels region (16.9%). However, even in some monolingual countries significant regional differences exists. In Austria, unemployment is far lower in the Salzburg and Tyrol regions unemployment is only 2.5% compared to 7% in Vienna. In Germany unemploymnet varied between 3.3% in Bavaria to 11-12% in Berlin and some other parts of eastern Germany. In Slovakia unemployment ranged between 5.8% in Bratislava to 18.7% in eastern Slovakia. And in Spain unemployment ranged between 12% in Pais Vasco in northern Spain to 30.4% in Andalucia in the south. Furthermore, in Italy which is monolingual apart from the South Tyrol region, unemployment differs from only about 5% in northeast Italy to nearly 15% in southern Italy. Germany is Europe's biggest economy right now, and during the coming two to three years or so its growth prospects looks better than the other big three European economies ( Britain, Italy and France) so it will in the short term not only remain the biggest but they are likely to see its relative superiority increase than see it decrease. However, in the long term, Germany seems almost certain to be surpassed by Britain and France. The reason for that is that Germans haven't had enough babies, and there are no signs that they are getting better at that. Last, year, only 663,000 babies were born, a new all time low, and abnormally low for a country that currently has 81.8 million people. By comparison, France with 65.4 million people had 827,000 babies and though I have been unable to find 2011 statistics for Britain, 807,000 babies were born there in 2010. In the short term, this has no effect on economic growth because infants and toddlers aren't employed. But in about 20 to 25 years or so (depending on how long they will study) they will as young adults be part of the labor force and as the large number of Germans born in the 1950s and 1960s retire in the coming decades, this means that Germany will get a much smaller labor force than Britain and France. And as the number of women in child bearing age in Germany is set to decline significantly in coming years, the birth rate will likely decline further even if German women don't become less inclined to have children. Indeed, even if they become more inclined to have children and the fertility rate (the number of births in relation to the number of women in child bearing age, usually defined as 15-45) increases that will simply prevent a further decline in births unless it is really dramatic. By contrast, Britain and France are set to little or no reduction in the number of women in child bearing age. Theoretically, Germany could compensate for this by increasing immigration, and that might indeed to some extent happen, but it has traditionally been less welcoming to immigrants than Britain and France and furthermore the Eastern European countries that in recent years been important sources of immigration for Germany are seeing demographic implosions that are even worse than Germany's. It is therefore difficult to see how immigration will prevent Germany's relative decline compared to Britain and France. -Growth in real retail sales in Hong Kong has slowed significantly in recent months, so that they "only" increased 5.8%. The Council of Foreign Relations have published an article which criticizes Paul Krugman and other Keynesians for using Iceland as a role model because GDP has dropped by less compared to the pre-crisis peak than the Baltic countries. Their argument is basically that it is wrong to simply take the pre-crisis peak in output as the standard, one should also consider how big the preceding boom was. And since the Baltic countries had far higher growth than Iceland, especially by the way if you adjust for population growth which they didn't, before the slump their long term performance is better. That is a point that Ryan Avent of the Keynesian The Economist magazine seems to have grasped, though he dismisses the higher previous growth as simply reflecting that the relatively poor Baltic countries were benefiting from the catch-up effect that poorer countries often benefit from.. But while that probably was one factor benefiting those countries, their relative poverty also meant significant emigration even before the slump something that in turn meant that their population dropped while Iceland's increased by 13% between 2000 and 2011. Taking population growth in to account both means that their initial boom was much bigger than GDP growth suggests and that the drop in living standards during the slump have been smaller. Paul Krugman, apart from quoting Avent's argument, have no real arguments except that if one sees the Baltic recovery as impressive one should also see the U.S. economy in 1934 as impressive because growth was 10.9% in 1934. But the CFR argument didn't simply depend on growth in the recovery, it looked at total growth in the whole period consisting of initial boom, slump and recovery, so Krugman's response was to an argument that wasn't made and he therefore didn't respond to the argument that was made, namely that just as it could be the case that a bigger slump could enable higher growth in the recovery, a bigger boom will mean a bigger slump to the extent the boom rested on larger imbalances. And both Krugman and Avent fails to notice the fact I pointed to in my previous post on the subject, namely that virtually the entire Icelandic slump came after its 2008 decaluation and that the mild recovery of the latest year came only years later-after the currency had stabilized. This fact illustrates the theoretical point that except during periods of secondary deflation, like during the 1930s depression , devaluation is in fact not something that boosts economic growth.